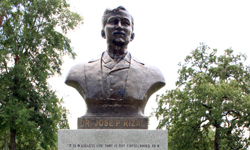 The bronze bust of Dr. Jose P. Rizal has been part of the City of Houston art collection since 2006. It is the work of Lorena Toritch. She is a master sculptor at the Young Fine Art Studio in Salt Lake City, UT. The bust celebrates one of the foremost historical heroes of the Philippines. 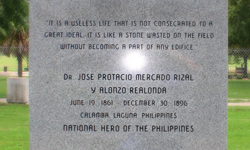 A doctor trained in Madrid, Paris, and Heidelberg, Rizal was a poet, essayist, and novelist. He was a proponent of national independence through peaceful reform. His execution in 1896 is considered the spark that ignited the Filipino fight for independence, and its anniversary is a national holiday.